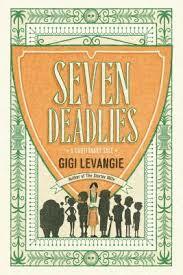 I just picked up, “Seven Deadlies: A Cautionary Tale” by Gigi Levangie on a whim. I had been meaning to read it though, however it was just one of the books that I picked up without reading the synopsis or the blurb. It was also one of those nights when I needed something light and though the book is quite deceptive with its writing style, it is anything but a light read. It is a fast read for sure though and lives up to that. “Seven Deadlies” is about the seven sins of the new world. The sins have not changed, however their perception and relevance has. The book starts with Perry Gonzales – a fourteen year-old Latino (ridiculed much about being who she is), who wants to become a writer, writing to Bennington – a premier university, talking about her experiences as a baby-sitter and tutor to children her age and below. She has been baby-sitting since the age of eight and the book is about her life in a Californian plush school, the Mark Frost Academy, and what comes with observing life of the rich and the famous and more so the lives of their children. Perry’s mother is a nurse and she is the only support Perry has. Perry only wants a better life for herself and in all of it, she chronicles the lives of others. The seven sins mentioned in the book are all related to children – teens or otherwise. Though the book is told from a teenager’s point of view, I don’t think it is meant for young adults. In my view, the book is of course a modern day fable on how soon childhood disappears and forms into something else along the way – given the world we live in. The competitive spirit is spoken of, the addiction to games, the need to want everything and more and more than anything else – the time spent with family is absolutely nil. On the surface the book is about different lives and lifestyles, however at the core it is about the world our children inhabit or just might. Levangie’s writing is perfect. It is fast-paced and yet the detailing is there and doesn’t let go at any point. It is not rushed. However, I thought the ending could have been better. It almost seems clichéd which did not work for me at all. The story telling manner is extremely unique and hence the four stars just for that and not to forget the brilliant plot. A great read – chilling, fearful, funny and intense at the same time. This entry was posted in Blue Rider Press, Books, Literary Fiction, Review and tagged A Cautionary Tale, Beverly Hills, Blue Rider Press, children, Gigi Velangie, Seven Deadlies, Teens on November 10, 2013 by thehungryreader.